To configure the integration into Legal Interact Practice Manager, assistance from Legal Interact will be required. Configure Practice Manager to export all matters to a comma separated file. Take note of this file path as it is needed when importing into Print Director. In the example above the leading zeros of the account number will be dropped. Also, all columns after the Name column are optional. The only column that may be checked by Print Director is column 5 (“Active”). If it contains “Suspend” the row will not be imported. Navigate to Scheduled Tasks > Winlaw Integration. Change the Scheduled Task Name textbox to Import accounts. On the Settings tab, ensure the Synchronise with Account Group drop down is set to the group into which you would like the accounts to be imported. Only transactions billed to accounts within this group will be exported to Practice Manager. In the Actions frame change the option to Import accounts only. In the Accounts file path textbox, enter the path to the file that is created by Practice Manager. In the Schedule Pattern frame, choose Hourly. Now, any updates to the matter.txt file will be imported into Print Director every hour. Print Director uses a Scheduled task for third party integrations. However, Practice Manager does not support the automatic importing of transactions on a schedule. So, we will set our Scheduled Task to never execute automatically. The only time it must be executed, is when the Cost Recoveries is going to be executed in Practice Manager. 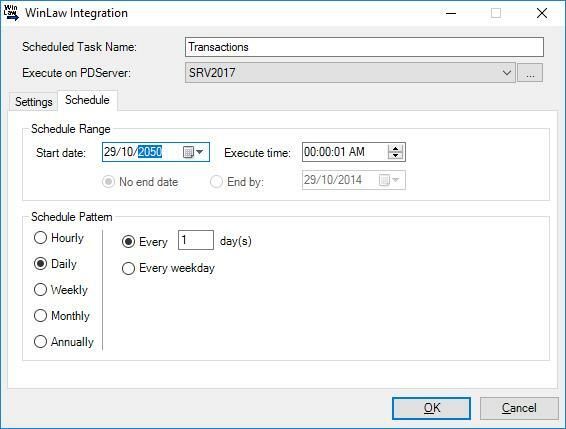 Change the Scheduled Task Name textbox to Transactions. On the Settings tab, ensure the Synchronise with Account Group drop down is set to the group into which the accounts were imported from Practice Manager. Only transactions billed to accounts within this group will be exported. In the Transactions file path textbox, enter the path where the transactions file will be saved. 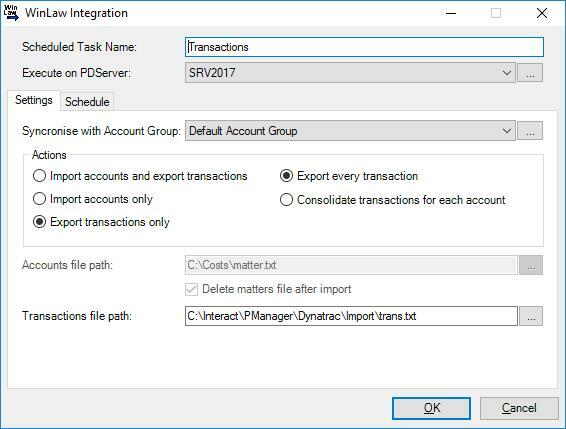 Since Practice Manager does not automatically import the transactions file, we must set this scheduled task not to execute automatically. To do this, we must set the Start date to a year far in the future (e.g. 2050). Then actual schedule pattern does not matter. In the right-hand pane, right click on Transactions. Choose Execute on next refresh. Right click on the server and choose Refresh. Now all the transactions will be exported going back to the last date it was run. The Cost Recoveries function can now be executed in Practice Manager.